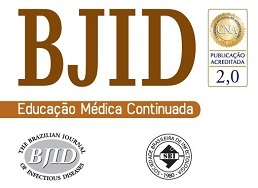 The BJID is an official publication of the Brazilian Society of Infectious Diseases (SBI), published bymonthly since 1996, from February to December and published by Elsevier Editora Ltda. Produced by the Editor-in-Chief, Dr. Carlos Brites, an editorial board and highly competent associate editors, the production staff and advertising board, the articles and communications published in the BJID aim to be relevant in the broadest sense to all aspects of microbiology, infectious diseases and immune response to infectious agents. The BJID is one of the most influential publications in its field in Brazil and Latin America with a high impact factor, since its inception it has garnered a growing share of the publishing market. In addition to six regular issues per year, the BJID published special supplements, conference and seminar, annals and reprints of individual articles, as well as advertising courses, competitions and seminars in all fields of medicine. CABI Publishing; Chemical Abstracts (CAS); China Education Publications Import and Export Corporation (CEPIEC); EBSCO Database (Premium Research); Elsevier Science - Bibliographic Databases Division; Embase/Excerpta Medica; Gale Cengage Learning; Index Copernicus International; ISI (Web of Science) - Science Citation Index Expanded (SCISEARCH); Journal Citation Reports (Science Edition); Kessler-Hancok Information Service; Latin America and Caribean Literature of Health Science (LILACS); LATINDEX; Medline/ Index Medicus/Pubmed; Qualis International (CAPES): B3 (International Quality); Redalyc (Network of Scientific Journals of Latin America, Caribbean, Spain and Portugal) SCIELO; SCIRUS (Elsevier); SCOPUS Index; Sociedad Iberoamericana de Información Cientifica (SIIC); Subis Database (SUBIS Bulletin); Swets Blackwell; Teldan Database Production; The US Library of Congress Office; Ulrich¿s Periodicals Directory. A 19-year-old male presented with asthenia, abdominal pain, vomiting, fever, jaundice, and rash. The patient quickly progressed to severe shock, purple lower limbs and toes necrosis. The diagnosis of Rickettsia spp (gene regions surveyed gltA (TaqMan) and internal control of the human RNAse P reaction) was made by PCR (polymerase chain reaction) of serum sample. Serial serology, with indirect immunofluorescence, also turned out positive with increasing IgG titers, initially <1/64 and then >1/256 two weeks later. The patient went on to present nystagmus and conjugate eye deviation. Magnetic resonance imaging (MRI) identified: multiple foci of marked hypointensity on susceptibility weighted imaging (SWI), evidenced in the corpus callosum, deep white matter, bilateral basal ganglia, thalamus and middle cerebellar peduncles, compatible with hemosiderin deposits, possibly petechial hemorrhages (Fig. 1). Foci of hyperintensity were observed on T2/FLAIR weighted images in the semiovale centrum, deep white matter and periventricular regions (Figs. 2 and 3). The patient was treated with chloramphenicol but progressed with extremity necrotic lesions, requiring bilateral transmetal amputation of toes and at the proximal phalanx of second, third, fourth, and fifth fingers of the right hand. He was discharged after 55 days of hospitalization for outpatient follow-up. Magnetic resonance axial SWI (Susceptibility weighted imaging), at the level of the basal ganglia, shows multiple hypointense foci suggestive of petechial hemorrhages or possibly microthrombi in the white matter (subcortical and within the corpus callosum) and internal capsules and basal ganglia. Magnetic resonance axial FLAIR-weighted image, at the level of the bodies of the lateral ventricles, shows a hyperintense lesion in the right periventricular white matter. Magnetic resonance sagittal FLAIR weighted image, shows hyperintense foci in the anterior portion of the corpus callosum. Dissemination to the central nervous system (CNS) occurs by hematogenous spread, with invasion of arterioles and capillaries, leading to inflammation and rupture of the blood–brain barrier. The possible findings on MRI include meningeal enhancement, varying degrees of swelling and periventricular and subcortical infarction, secondary to vasculitis, which tend to occur in a perivascular distribution, as observed in this case (which can mimic demyelinating disease).2,3 The CT scans of the head can be normal or show diffuse white matter changes, sulcal effacement and/or focal hypodensities consistent with infarctions.4 However, MRI is the exam that better characterizes CNS involvement in this entity, evidencing both multifocal hemorrhages and the foci of white matter changes due to vasculitis. R.P. Araújo, M.B.M.A. Navarro, T.A.O. Cardoso. Febre maculosa no Brasil: estudo da mortalidade para a vigilância epidemiológica. Spotted fever in Brazil: mortality study for epidemiological surveillance. S. Crapp, D. Harrar, M. Strother, C. Wushensky, S. Pruthi. Rocky Mountain spotted fever: ‘starry sky’ appearance with diffusion-weighted imaging in a child. Teaching NeuroImages: Starry-sky appearance in Rocky Mountain spotted fever. L.R. Sun, T.A. Huisman, A.K. Yeshokumar, M.V. Johnston. Ongoing cerebral vasculitis during treatment of Rocky Mountain spotted fever. R.D. Tien, P.K. Chu, J.R. Hesselink, A. Duberg, C. Wiley. Intracranial cryptococcosis in immunocompromised patients: CT and MR findings in 29 cases. R.E. Fernandez, M. Rothberg, G. Ferencz, D. Wujack. Lyme disease of the CNS: MR imaging findings in 14 cases.